This is a schedule of bonus times in the UK and Ireland for the next 2 months. *Exact date unknown. This is a prediction based on dates from previous years. 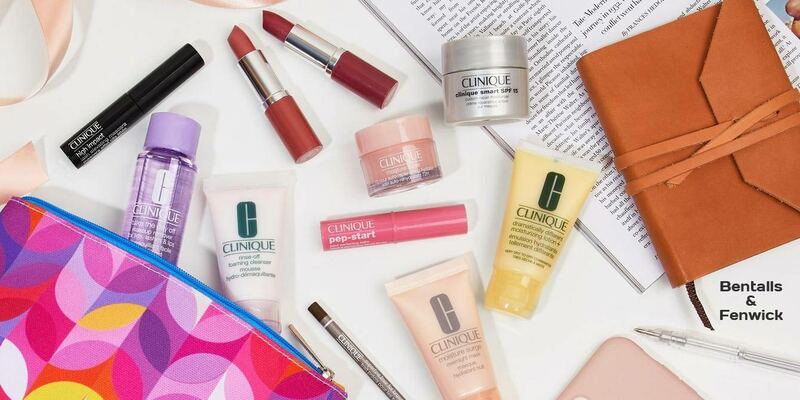 To qualify for a free Clinique gift in the U.K. or Ireland, you have to usually make a purchase of 2 or more Clinique products (one to be foundation or skin-care). Note that some offers are available in-store only. Update 14 April: The gift has been extended for another week. Offer on till Good Friday (19/4), or while supplies last. 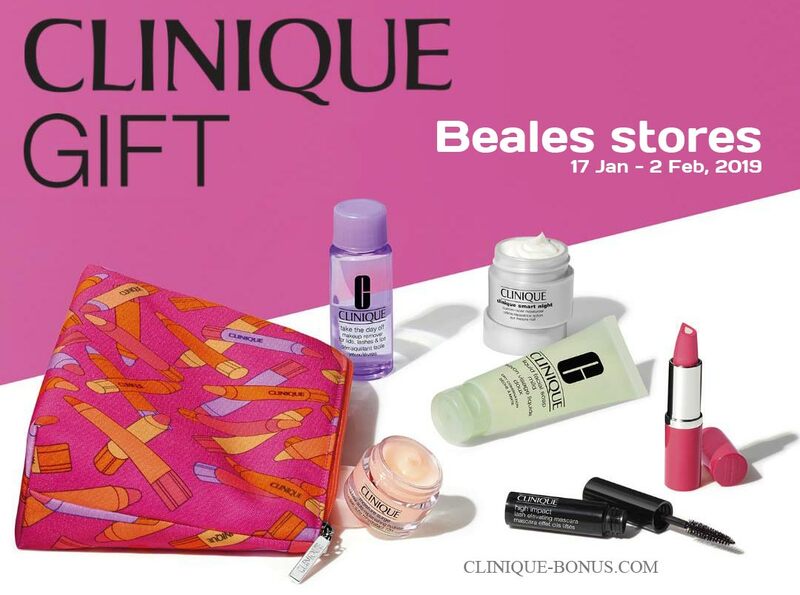 Clinique gift time at Boots runs from 28 March 2019 online and at selected stores. Receive FREE six-piece Gift packed full of makeup and skincare favourites. Yours with the purchase of two or more products, one to be skincare or foundation. Note that in store offer may vary. Shipping: Standard Delivery (within 4 working days) costs £3.50. Free on orders over £45. To avoid disappointment: Check if the gift is shown in your shopping bag before placing your order. If not, you haven’t qualified for the gift and you will not receive the gift with your order. Note that not all Clinique products qualify for the gift. Purchase requirement excludes Clinique mini size products and treatment accessories. 11 – 27 April, 2019. In store only. 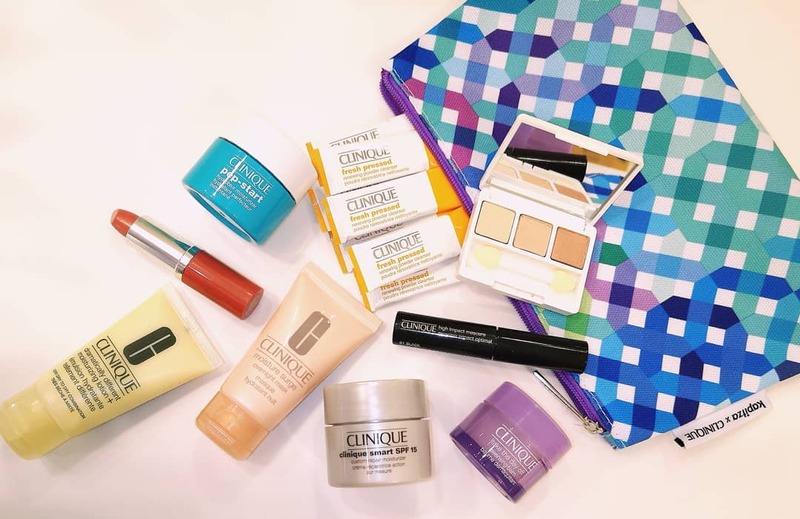 Visit Browns Clinique counters between 11th and 27th April, 2019 and make a qualifying purchase (2 products, one to be skincare or foundation*) to receive this 7-piece gift. Free. Available in store only. Use store locator and find your nearest Browns department store. Promotion ends on 27 April, 2019 or while supplies last. Below are the most popular bonus times across the U.K. and Ireland in the past 12 months. Check out the previous months to see what to expect, as the stores tend to follow a pattern from previous years. Below is a bonus time available online on the Harrods website. Note that in store offer may vary. 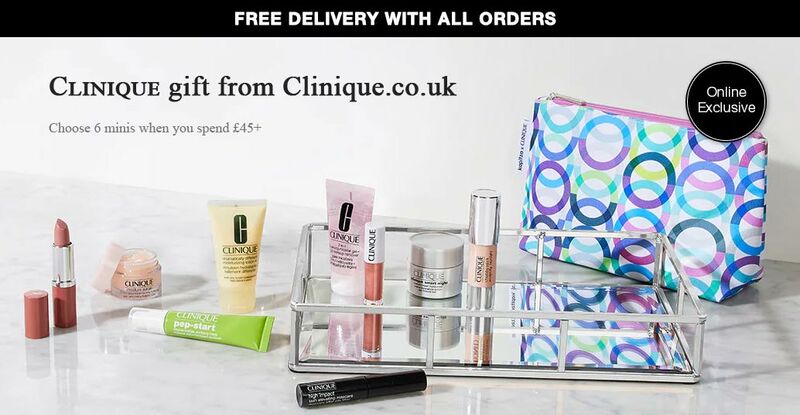 Complimentary gift when you spend £55 or more on Clinique. While supplies last. Spend £75 and also receive a free Moisture Surge Overnight Mask. Harrods doesn’t offer free delivery. The delivery charge starts from £5.95. Update 10 March: There are still 4 Clinique bundles available online which will qualify you for the gift. 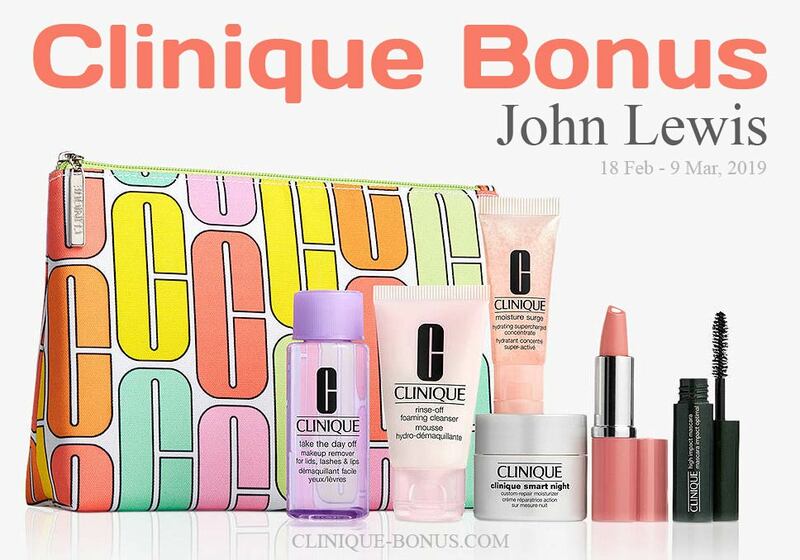 Online and instore* there is a new Clinique bonus at John Lewis starting from 18th February to 9th March, 2019 or while supplies last. In order to get this 7-pc gift you have to purchase at least one Clinique bundle from these selected Clinique bundles (4). Plus, there is an extra gift (Moisture Surge Overnight Mask, 100ml) included in more expensive Clinique bundles. The cheapest one is for £48.50. Standard shipping in the UK is free for orders over £50, otherwise £3.50. *The gift and the qualifier may vary in stores. Stop by at Clinique counter at John Lewis and make any two Clinique products purchase (one to be skin care or foundation) to receive a free Clinique gift. The promotion ends around 9 March, 2019. 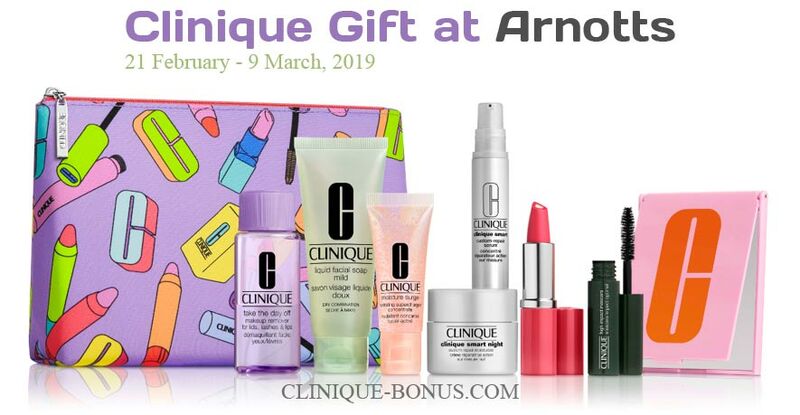 From 21 Feb to 9 Mar, 2019 there is a Clinique gift at Arnotts Ireland. Online and in stores. 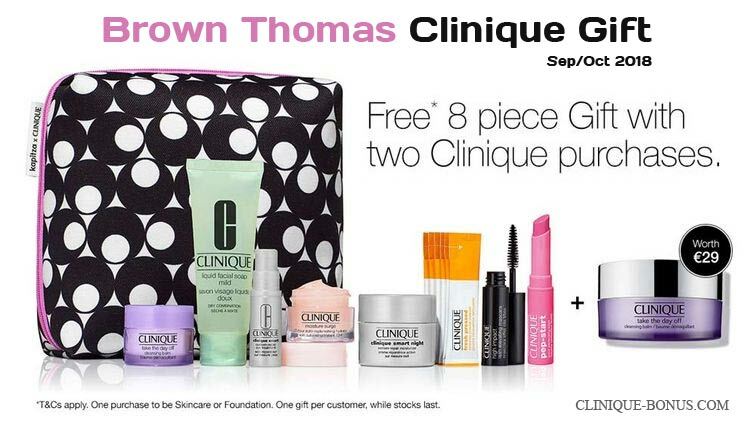 To qualify for this complimentary 8-piece gift make two Clinique purchases, one to be Skincare or Foundation. Plus free Moisture Surge Overnight Mask (worth €39) with any third purchase. Available while stocks last until 9 March 2019. It’s gift time on Clinique. 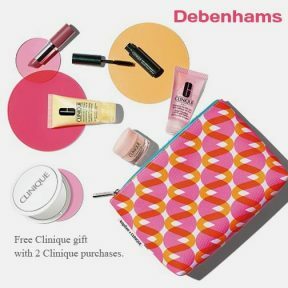 Shop on Debenhams.com or Debenhams.ie from 31st January to 17th February 2019 and receive a free 7-pc gift. Yours when you purchase any two Clinique products, one to be skincare/foundation. Online and instores. + free Cleansing Balm with 3rd purchase. Online only. + free Cleansing Balm and Body Polish with 4th purchase. Online only. You will automatically receive free delivery from Debenhams UK with £45 spend or enter enter promotional code SHA5 for free delivery on your beauty/health order with no minimum spend. Delivery from Debenhams.ie is free when you spend €30 or more. Clinique gift time at Bentalls and Fenwick starts on 17th January, 2019. Available instore only at Fenwick stores nationwide: Bond Street, Bracknell, Brent Cross, Canterbury, Colchester, Kingston (Bentalls), Newcastle, Tunbridge Wells, York. Choose your 8 out of 10 luxury samples when you purchase 2 items, one to be foundation or skincare. The promotion ends on 2 February 2019. From 17 January – 2 February, 2019 there is Clinique gift with purchase at folowwing Beales stores: Bournemouth, Hexham, Poole, Southport, Bedford, Yeovil, Kendal, Worthing, Keighley, Peterborough and St Neots. A 7-piece Clinique gift – yours free when you buy 2 or more Clinique products (one to be skincare or foundation product). Available until 2nd February 2019 or for as long as stocks last. 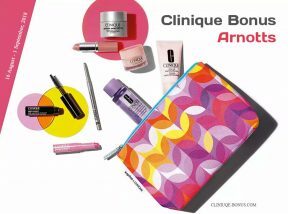 Receive this free 9-piece Clinique Spring gift from Brown Thomas. Yours with any purchase of 2 units of Clinique one to be skincare or foundation. Standard delivery (2-3 days) is €3.50. The first UK bonus time in 2019 starts on 12th January 2019 on the Clinique.co.uk website. A free 7-piece winter kit gift with a limited edition makeup bag. Yours free when you spend £45 or more and enter offer code WINTERKIT at checkout. Important: You must enter an offer code to redeem your gift. Only one code is allowed per order, enter it during Checkout at Clinqiue.co.uk website. You will also receive free Standard Delivery (2-5 working days). Offer ends 11:59am 28th January 2019 or while stocks last. This promotion is available instore only; from 18th October to 3rd November, 2018 exclusively at Harrods. Choose 8 out of the eleven products and take them in a Kapitza cosmetics bag. In order to receive the 9-piece gift you have to visit Harrods (87–135 Brompton Road, Knightsbridge, London) and make 2 qualifying purchases, 1 to be skin care or foundation. With any third purchase you will also receive a full size Moisture Surge Overnight Mask. While limited stocks last. Starting from Thursday 4th October, 2018 there is Clinique gift at Debenhams online (Debenhams.com and Debenhams.ie). 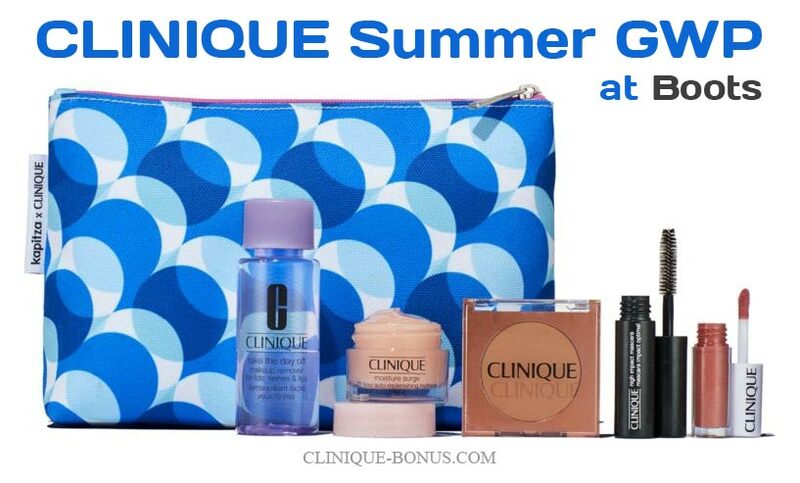 Yours with the purchase of two or more Clinique products, one to be skin care or foundation. Note that the in-store gift may vary. Plus receive also free full-size Moisture Surge face mask (worth £31) – free with any third Clinique purchase. Debenhams UK delivery: Standard delivery (within 5 working day) is £3.49, Free on orders over £50. Next Day delivery costs £3.99. Unfortunately, international delivery is unavailable for Clinique products from Debenhams. Debenhams IE delivery: Standard shipping is 4.95€. Free for orders over 30€. Next day shipping is 5.95€. The promo ends on 23 October 2018, or while supplies last. 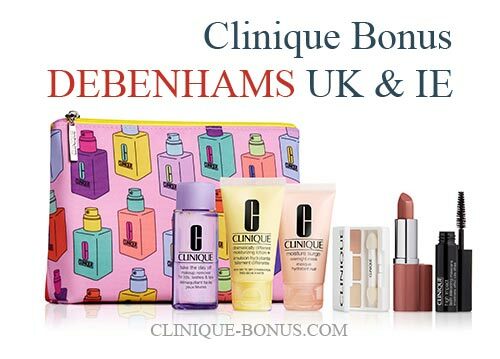 Unfortunately, you can’t combine this GWP offer with any Debenhams discount codes. From 21st September to 6th October, 2018 there is bonus time at Brown Thomas Ireland. 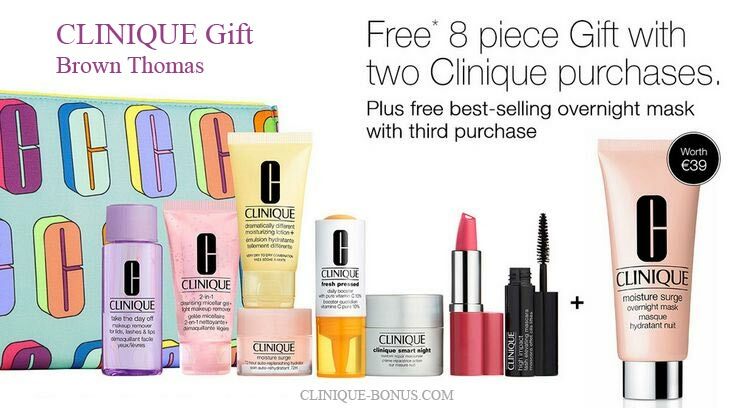 It’s an 8-piece gift – yours free with any purchase of 2 Clinique products, one to be skincare or foundation. An additional full size Take the Day Off Cleansing Balm when you purchase a third Clinique product. Online and instores. Note: Gift contains promotional size items. BrownThomas website delivers in Ireland only. Standard delivery (2-3 days) costs 3.50€. From 13 – 26 September 2018 there is a bonus time at Fenwick and Bentalls. In-store only. 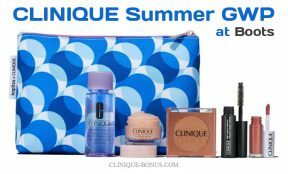 Receive an exclusive complimentary gift (you can choose 8 freebies to go in your makeup bag) with the purchase of 2 Clinique products. One to be skincare or foundation. The gift is available at these Fenwick locations: Bond Street, Bracknell, Brent Cross, Canterbury, Colchester, Kingston (Bentalls), Newcastle, Tunbridge Wells, York. Detailed locations can be found here. 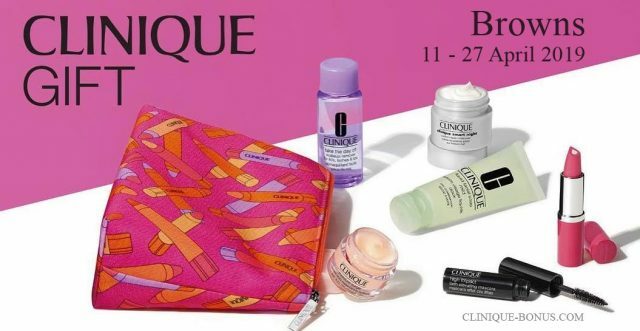 Spend £45+ on the Clinique.co.uk website from 5 to 23 September, 2018 and choose 6 minis + also receive a limited edition makeup bag and free shipping. Spend £65+ and enter code DAYOFF65 and enjoy two extra samples (Quickliner For Eyes Intense – Intense Ebony and Chubby Stick Intense™ Moisturizing Lip Colour Balm, Broadest Berry). Free delivery with all orders. Offer ends 11:59pm 23rd September 2018 or while stocks last. It’s here! 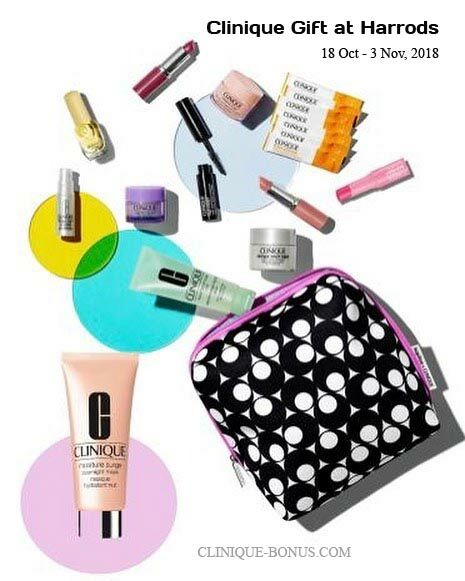 Clinique bonus at John Lewis – from 16 August to 1 September 2018.
online: purchase Clinique bundle. There are 16 to choose from, priced from £35.50 – £82, which will qualify for the free gift. Note that the gift varies in stores. Shipping is free on orders over £50, otherwise £3.50. From 16 August until 1 September, 2018 there is a Clinique gift at Arnotts online & in store (Dublin, Ireland). 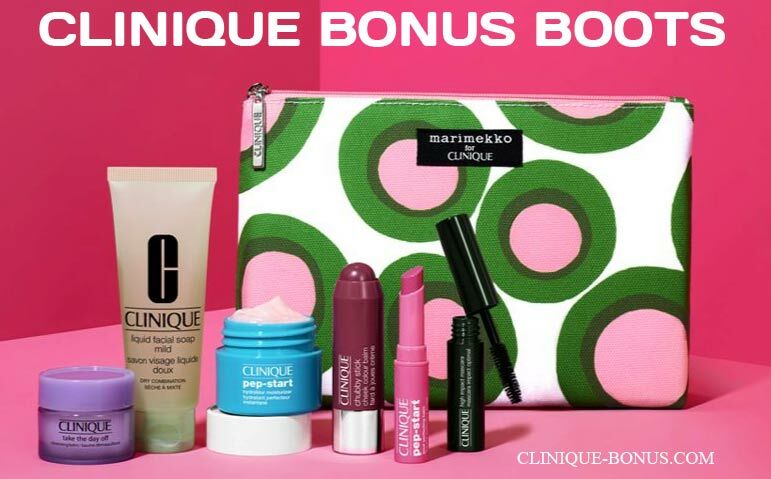 Receive this gift of beauty treats with the purchase of two Clinique products, one to be Skincare or Foundation. In store only: choose 8 pieces out of the 11 and receive a full sized hand cream (worth €23) when you buy a third Clinique item. Gift time at Beales. 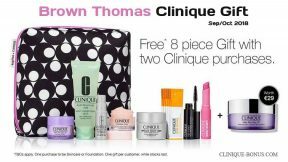 Receive your free 5 item gift bag – free with a purchase of two Clinique items. One must be skincare or foundation (not including minis or treatment accessories). In addition with purchase of 3 items receive a 50ml DDML+. Free. The gift is probably available in stores only, not available online. Find your nearest Beales store here. Note: The next bonus time in the UK will most likely be at John Lewis. 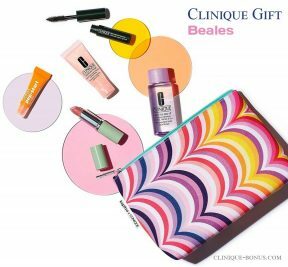 A free 6-piece Summer Clinique gift – available exclusively at Boots.com and Boots.ie (Ireland) from 26th July – while supplies last. Note that the gift may vary in-store. Free when you buy 2 selected Clinique products, 1 to be skincare. Buy three products, one to be skin care or foundation and receive a bonus full size gift – Clinique liquid facial soap mild. Standard Delivery is £3.50 or free when you spend £45 or more. If your are from Ireland and shopping on Boots.ie – the delivery is €5 or free when you spend €50 or more. This is not a regular bonus time, but I think it is worth to mention it; spend £40 at Debenhams.com or €50 at Debenhams.ie and you will receive these 6 deluxe minis. While supplies last. You can also enter promo code SHA5 at checkout for free shipping. There is a new Clinique bonus at Boots.com and Boots.ie. Spend £45 (or €50 in Ireland) on selected Clinique and receive this exclusive to Boots gift. Not sure if this promotion is online only, there are almost no details about this GWP offer. However, the gift appears in the basket when I test this promotion. Note: Gift contains promotional size items. On Boots.com you will qualify for free instore collection. Home delivery is free for £45+ orders. If you are from Ireland, you can shop on Boots.ie and the shipping is free on orders over €50. Update 20th May: This promotion has ended. The next Clinique bonus in the UK will most likely be at Harvey Nichols starting at the end of May. There is currently a bonus time at House of Fraser online and in-stores. Available from Thursday 3 May to Saturday 19 May, 2018. Note the in-store offer may vary store by store. To qualify you have to purchase 2 or more Clinique products. One to be skincare or foundation. Get something EXTRA: With any third purchase receive your free additional gift: Clinique Sparkle Skin Body Exfoliator. Free shipping is when you spend £50+. Otherwise UK and Ireland delivery is £3.95. International delivery is not possible. I purchased two Clinique items yesterday at Boots in Epsom and was pleased to receive the free gift bag but when I got it home I only had four items in it and I think there should have been more. I don’t want to have to travel back to Epsom and pay to park etc. Please can you help? Many thanks. Do you know what is in the harrods bonus? Do you get more items if you go In store rather than online? During Clinique bonus time, if buying online the skincare products, are the bonus gifts included ? Does anyone else agree that the bonuses so far this year have been pretty unexciting? All the bundles to qualify for the JohnLewis bundle are already out of stock!! This must be a temporary error on the John Lewis website. The bonus time starts today. could you please tell me when the next bonus time is for Debenhams and John Lewis in the UK? bonus time at Debenhams starts January 31, followed by John Lewis later in February (around Feb 17th). Can you please advise when your next Bonus time is scheduled for Boots or John Lewis or online? Quite delighted to have been alerted to the online offer yesterday – it’s a bonanza! thank you Alice. It’s worth mentioning there is also a (more modest) men’s gift available online too. When will the next bonus time be that is online? None of these are for online purchases of 2 items, I need to renew my foundation and face wash but want to wait till i can qualify for the bonus gift via an online purchase 🙂 – will it be John Lewis? I would like to say my husband and son have used clinique mens range for many years. I purchase my products from boots. Birthdays. Xmas. Fathers day etc. But it frustrates me when you are on gift. I am sensitive to your products so everytime i have the oppotunity to choose items there is NEVER mens choice! So my boys never get the benefits of clinique on Gift. A tad sexist dont you think? Yes, the offer is no longer available at Boots. House of Fraser are denying any knowledge of the body scrub with any third purchase. Surely this constitutes false advertising? I purchased 3 items online, received the goodie. Bag, but no scrub. Have sent them a screen shot of the adverts from two different websites, but they claim to know nothing about it. House if Fraser are refusing to honour the ‘buy 2 products and receive a bonus bag’ ehich is fue to run until mid May. They say the promotion only applies to their Recognition card holders. This is not mentioned in your link to.their website nor can I see it on their website. I’m very disappointed. Is this legal for these adverts to be fake? I too have had problems with HoF. Bought three items but did not get scrub. They deny the offer exists despite me sending them screen shots from two websites clearly advertising it. This is false advertising. I seem to have been shortchanged in Boots of York todau – my bonus gift did not contain the chubby stick, nor the lipstick, not the pep start cream. I did receive a sample of take the day off make up remover. I was not offered a choice of items. I’ve just seen (and used) a Clinique Bonus at my local Pharmacy in SE UK. It’s a Pyramid Pharmacy, formally a Lloyds Chemist. Gift is a Marimekko bag with 5 goodies in. Very nice. I used to receive text messages for bonus times in local stores, Peterborough area, but they seem to have stopped coming. I enjoy bonus time but miss them as I do not go into Peterborough on a regular basis only when I need something. If possible I would be grateful if the alerts could be reinstated please. Amanda, you will need to ask Clinique to do this for you. Come to think of it, I haven’t received any text reminders from Clinique for quite some time, but I do still get the little post cards delivered, and of course I regularly look at this page which is run by Alice. When is the next bonus time in Boots? The next bonus time at Boots will be on 6th March 2018. I understand there is a gift at Fenwicks/Bentalls starting on 18th January (tomorrow!). They usually have really good ones. My mother has a card showing the details but I can’t find anything online. Customers can choose 8 /11 items and there is a step-up gift of moisture surge overnight mask. I can’t wait! My daughter and I were wanting Clinique for Christmas, there are no Bonus times in the Newcastle area, we are very disappointed and you have lost sales. Gillian – this website is not Clinique, it’s about Clinique bonus time and is voluntarily run by an individual to help other shoppers. Gillian this website is not connected to Clinique. It is run by Alice (see the ‘About Me’ section on the right of the page) who very kindly lets us know of any upcoming Bonus Times. Also, Clinique have never had a Bonus Times in December – they don’t need to have any promotions in the approach to Christmas. Hope you are well? Can you tell me when the next bonus time is coming to boots or Debenhams? I think the next GWP offer at Debenhams will start in February 2018. Then in March at Boots. I went through the online chat and explained My normal foundation is Cream Chamois even better and asked what the equivalent is to this in the new even better glow so I can try this. Your Charline assistant was useless and took a very long time to come back and tell me to buy the same shade in the new glow. I spend ages trying to find this online then went to store to be told this shade didn’t exist. Thanks for wasting my time I have been a very loyal customer for over 25 years buying no other skincare or foundation and I honestly do expect (and have always experienced) better. They also have “Wrappings” the only stockist in the U.K. If you check the previous promotions you will see that the next GWP will most likely be at Debenhams (early October, like it was last year). Bonus time at Harrods was from 20 Oct last year, so you can expect the start around this date. I bought 2 skincare items from Jogn Lewis on 2nd September which was the last day of their bonus time. I did not receive my free gift with my order. I contacted them to be told that they must have been out of stock! I would have held off and ordered from elsewhere to get my bonus time if I had been informed at the time. Is there any way of getting my gift if i can supply proof of purchase? Hmm, I am not sure. 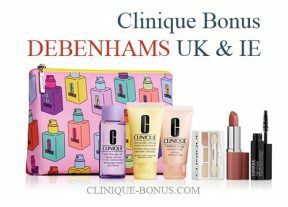 If you check the schedule on my homepage you will see that last 2 bonus times at Debenhams were in February and October 2016. So maybe we will have to wait 2 more months? Hi. I was in Debenhams yesterday and the assistant on the Clinique counter said October. Can you please advise when your next Gift with purchase promotion will be at John Lewis stores? Hi I have ordered from boots website and am planning to get my other bits in store as weren’t available online. Due to collect my order tomorrow. Does anyone know if it is the Plum or Punch colour supplied as standard in the online gift? Need to know so that I can choose the other colour when I purchase in store. Thanks in advance to anyone that can help! I purchased two skin care items at my local boots today (pep-start exfoliating cleanser and pep-start blue moisturiser) £41 in total and I did not receive the current promo gift. I did not think about it until I returned home and I thought I qualified. Is this correct? Why are you expecting this website to reply re this ? This isn’t Clinique, it is a website about Clinique, and, more specifically, Clinique Bonus Time, so shoppers can maximise their purchasing – the poor lady running this website does a cracking job of informing consumers, and you would be better contacting Boots or Clinique. Thanks you for your information. Obviously I was not aware of this. I don’t run this site but I think I can answer your question. Boots haven’t had a Bonus Time recently. 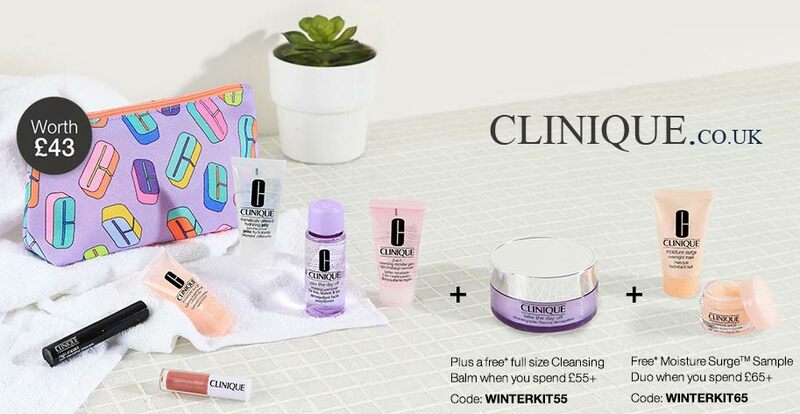 The current Bonus Time is on the Clinique.co.uk website, so you have to make your purchases online from the Clinique website to get the Bonus gift. The lady who runs this site will let us know when the next Bonus Time is on at Boots. The same thing happened to me! And they were advertising a free gift with purchase on their website. Shameless as I am, I returned my purchases, simply explaining that I’d been expecting the free gift, which they had no problem with and said they likely ran out.. better luck next time! When is there a Clinique bonus time in Guildford? Any news on the next bonus time in the UK? The current one doesn’t have the miniature DDM so I’m hoping the next one does. can you please email as to when the next house of fraser, boots and Stanstead Airport are next having their bonus times? I used to receive notifications via e mail of upcoming bonus time offers, unfortunately they have stopped Nx I have no idea why . Is it possible to order online from harrods? I think it is possible but you will not receive the gift. What will the next gift event in boots be? On the 16th of March 2017. To be honest, I have no idea, there are no info about this promo anywhere. Are you offering a Clinique promotion at Boots this year (2017)? I placed an order with John Lewis yesterday and when I checked out I was not given the option to obtain the bonus time gift set. Customer services said that my order did not qualify for the bonus time gift set. However, on checking the Clinique Bonus Time Website I should be entitled to the gift set as I ordered two skincare products. I have been buying Clinique for 33 years. Very disappointed. 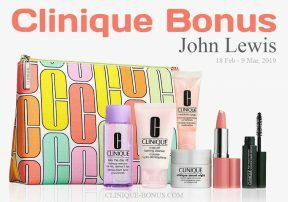 The online qualifier for this promotion is to purchase one of any Clinique bundle. There were 18 bundles to choose from, but the page containing those bundles is not available at this moment. I don’t know why. I made the same mistake with John Lewis and ended up returning it all as I only bought the products as it was bonus time. I bought two skincare items but they didn’t ‘qualify’. I just wanted to say thank for running this site! I always check this before I pick up a new item so I can benefit from the bonus time. I always thought it was an official site and hadn’t realised it an individual running it. When is the next bonus time at House of Fraser stores and online (UK) please? I think it will be in May. Ordered two items (one skincare) from House of Fraser a few days ago so free Clinique bag was part of order. Delivered today without free gift so phoned House of Fraser who are unable to tell me what has happened and will get back to me in 48 hours. Very poor – they are still showing the free gift as available on their website and when you checkout. Seem v unwilling to sort this out immediately. Does anyone know when the next Harvey Nichols BT will be? My first experience with Clinique at debehams Basingstoke . Vicky was amazing listen to my concerns regarding rosacea. I purchase redness foundation and yellow compact power. Total of £51.50. I was surprised to find no free gift offer in store . But would have gotten this if I purchase on line. I have sensitive skin and buy Clinique products as they are excellent value – however could I request the bonus gifts include colours of lipstick or eyeshadow that can be used on darker skins. The colours tend to suit lighter ladies – I am african and can never use the the lipsticks or shadows – you must have colours that are applicable to all. I second that! And so do many of my friends. It’s easy to offer an option for dark skin and one for pale skin. As per your email with Clinique bonus time at house of fraser – you offered a full size make up remover when purchasing a third item. I went into House of Fraser Milton Keynes to purchase three skin products and was told that if I had received this offer that they were sorry they couldn’t give me the make up remover as they never received stock. I was not even offered an alternative. I have been a customer of Clinique for aboutt 20 years (In South Africa and UK) and was shocked at this service. The ladies were lovely and not fault to them at all – but the fact that there was no alternate item for the mess up. Please can someone respond. Kind regards. Hi I ordered the Clinique sonic cleansing brush online worth £79.00. My package arrived yesterday and there was no bonus time gift (Online qualifier: yours free when you spend £50 or more on Clinique products) and no other free gift (and get something EXTRA: with every 3rd purchase (instore) or with £65 spend (online) you will receive a full size Take The Day Off makeup remover (a £17 value). Free shipping is when you spend £50+.) as quoted above. I rang up to ask where they were and the person I spoke to said that I woud only qualify for the gifts if I had a recognition card. This is clearly not stated anywhere above, and as a result I will now be returning this item to yourselves and you you will lose the sale. I would appreciate any comments you may have regarding this mix up. This isn’t the HOF website. This is an independent site that just gives details of what offers are on where. I think it’s a bloody good site, and check it before each Clinique purchase, in case I can get some freebies at another department store. YOU NEED TO SPEAK TO HOUSE OF FRASER. How some people get by in life.. the mind boggles. I’m sure I saw yesterday that if I return a used Clinique facial wash to Debenhams, I would be given a new on. Have I dreamt this? I have just missed the boots bonus by one day, I have 3 products to buy, can you tell me when the next bonus is on in the UK and which store please. What do I need to do to order the Clinique items to receive the free gift online for the store Boots?? I would like to know what counts as skincare for the John Lewis gift please. I was told Clarifying Lotion does not count. My mum says Bonus Time at Boots starts on 3rd March. I love this website, I check it almost daily! What about Harrods and boots? Also where do you think the best gifts are from? Harrods are pretty good but not so easy to hear about it and get there! Any idea when and where the next bonus time will be ? I tried to order on line from Harvey Nicoltts but noticed the free gift was not added. I call them and told me that the bonus time is available only in store. unfortunate i do note have a store close to where i live. I was under the impression the “free sample was from Clinique. do you mean on this page? It could be one of the advertisements. I have moderated the “free samples” ads on my website, so hopefully they wont be shown again. probably at Harvey Nichols at the end of November. But I am not sure. really nice to hear that someone finds this website useful. thank you. Me too you do a great job!! last year it was from 23rd Oct. So one more week. Hey I was just wondering when the Selfridges bonus time was? I understand that you may not know, but based on previous years is it likely for there to be one before Christmas. Thank you so much and the the website is great! hmm, I dont post about this bonus, but if you think it was around this time one year ago, it should be again around those dates. Hi I just attempted to order from BrownThomas but they only deliver to addresses within Ireland,thought you would find this comment helpful. yes, thanks for the info! I didn’t know about this. Just been to Fenwick Leicester, Clinique Bonus Time has started today with 10% off purchases for today only. Please could you explain to me why you advertise that John Lewis have a Bonus Time if you purchase one skin care and one other, but when I ordered online with John Lewis I did not qualify for my Bonus Time gift due to the fact that you have to buy a bundle. I am extremely cheesed off, as I was under the illusion that I should received it. I now have two products from Clinque and no Bonus Time gift. I was wondering if you could tell me when the next bonus gift is going to be on and in which store in the UK, once the Boots one has finished. I don’t need to replenish just yet, so wondering if I could hang on until the next bonus time. at Beales from 13th August to 29th August. Thanks for being my regular visitor. I try to do my best to cover all promotions in US, UK and AU but maybe I can miss something. However, I post only regular bonus times (happening nationwide, not only in one store in one city). There was such a promo at Harrods in April this year and following the rule (two bonus times at each store in a year) the next bonus at Harrods should start in October. Hi I am one of clinique client since I was 18. I am 42 years old and always using clinique for 24 years it was such my happiness that everytime i buy clinique products i always get my free gifts. I was just gutted when I bought my serum last month which cost me £69 and ahe just gave me 2 mousse wash and 2 sample foundation in a tiny little tub. I was desperate to buy my serum as I have no more time to buy somewhere as im going away and dnt want to miss days without applying them. I was really gutted i have not received my free kit. I bought my clinique serum at Boots aituated at Trafford Center in Greater Manchester UK. I would like to ask if thongs like this will I still redeem my free gift as I love to have them. What is going on with the recent Bonus Time at Harvey Nichols ? ( Liverpool in my case) Demand massively outstripped supply. As a lifelong Clinique customer I always look forward to Bonus Time – it seems bad marketing to promote this more generous than usual gift, then run out of stock . Poor management from Clinique & Harvey Nichols. I welcome your response to this complaint. V disappointing HN has clearly run out of advertised freebies there are less and none are whats advertised! I visited Harvey Nichols in Leeds to replenish my favourite dramatically different moisturising lotion and deep comfort body lotion with pumps while bonus time was on, specifically to also have the small sizes for a forthcoming short trip. I was most disappointed to arrive home and open the gift bag to find only 4 of the promised products including half a bottle of dried up nail varnish! The small bottle of moisturiser, wanted for my flight of Friday was one of the missing items. This is very poor service and not what I would expect of either Clinique or Harvey Nichols! There seems to have been lots of different Bonus Time offers over the last few months but none of them have been for men. Please can you advise when and in which stores we can expect the next men’s offers. Can you please answer as to why is there such a big difference in the bonus time gifts that are offered at Harvey Nichols, Harrods etc as compared to Boots and House of fraser. The ones offered in Harrods etc are so much better despite the fact the customers are paying same price for your products in every store. Please make it fair for all by offering same bonus time nationwide.I really hope you will not disappoint us and will be offering same bonus time gifts in all stores. I have been a clinique customer for about 10 years now. Today I popped in to House of Fraser to get my bonus clinique present with the purchase of my must haves: the anti blemish foundation and deodorant. I have been refused the gift as none of the items are considered asskincare. Nevertheless, the online store still offers me a gift for the purchas of foundation and deodorant. Please advice why customers are treated differently online? I am sorry you have started testing on animals again. I will only purchase your products again whey you stop, and adopt a fixed cut off date. Is there any way to know if the House of Fraser May 7 2015 gwp will ever be available, at any store(s) in the future, in the U.S.? Hi could you please tell me where and when the next bonus time is in Dublin Ireland many thanks Niamh. Your website mentions a spécial offer at John Lewis but the offer on John Lewis website is different, more restrictive (2 skincare products instead of one plus other) and fewer freebies. Can you please explain what to do to get the offer you mention? Hello, I have been a Clinique customer for more years than I care to remember but am becoming frustrated at the lack of availability of products at in store concessions during Bonus Time offers. To-day I visited John Lewis, Newcastle where I intended to purchase blended face powder and dramatically different moisturising lotion. They had the latter but not the colour powder I required. I left without making any purchase and instead went to Boots where I made the necessary purchase minus my freebies. Last month I had a similar experience at Fenwick, Newcastle for their Bonus Time when they did not have any dramatically different moisturising lotion in a tube. Surely these items are very basic and concessions should be well stocked up for their respective Bonus Time. I am not sure how things work between Clinique and in store concessions but if possible I would be obliged if you can investigate. I await your reply with interest. Unfortunately, Grace, Clinique cannot stock infinite amounts of products. And they have no way of predicting what may or may not sell well during bonus time. Some stores go as far as to triple their stock of popular items during bonus time, however this still doesn’t rule out any chances of things being out of stock. One day they might sell 10 Dramatically Different moisturisers, then they might not sell one for 3 days, then they might sell 30 in an hour. it would waste money, space and time if Clinique were to order excessively. Most stores should have an order terminal, where you can order your products that are out of stock and they will be delivered to store for free, the next day. You would still be eligible for your bonus bag and it means you rarely ever have to worry about it being out of stock. I hope this helps, Grace. The Bond Street store Fenwicks ran out of mild face wash and toner so I couldn’t buy anything! And they told me they were closing the offer a week early. Not impressed. Exactly the same has happened to me! And the sales assistant was not helpful at all i.e. she didn’t even tell me when and if they’ll replenish the stock & instead tried to sell me the face wash for oily skin! Like I could change skin in front of her?? Not impressed as well. They tried that with me! And tried to tell me to use the bar soap (which doesn’t suit me) then told me to buy from Fenwicks website even through that isn’t a transactional website! I emailed them but all they did was ask for a description of the sales assistant so they could tick her off! I was told by the Monument London H 0f F store that the free gift was not applicable to the purchase of two mens skin care products. I feel this is wrong as it doesn’t state that on any promotional material. it’s not the 15th yet but already HoF has withdrawn the offer. NOT IMPRESSED WITH HOf, BOOTS MORE RELIABLE. I ordered on the website on 13th October – 4 days after the bonus offer started and was told they had no stock left when I asked why my gift was not sent, I am returning my order and will not order from Debenhams online again. I am sorry to hear it, Sue. From their website: “Gift is out of stock if it does not add to your basket at checkout”. Did you have the gift in your basket? No it wasn’t showing in the basket but it didn’t say out of stock or unavailble I did try phoning but after half an hour on hold I gave up. I tested it today and the gift is still in the stock (it was added in my basket). Are you sure that you made the qualifying purchase correctly? I ordered a foundation and a skin care product so yes I did qualify! I am sorry to learn that the Clinique free gift was not added to your recent order 700003399812. We strive to ensure that all customers? orders are shipped with relevant free gifts. However, during busy periods like the ongoing sales, this may not be possible due to stock availability. I am sorry to advise that the free gift is currently out of stock, and will not be sent out with your order. The free gift is out of stock if not added to the shopping bag. why is the UK gifts always look nicer than the US gift ? Because we pay twice the price for the original products! What is $15 in the US is £15 over here. I always stock up when I fly to the USA or send a shopping list with visiting family of four my brother to bring when he flies back. And if that’s not possible I make sure that I get my bonus time gift! That’s because some customers are literally so greedy asking for so many samples, when I worked there we hardly got any in store so only give them out when we genuinely had a recommendation for a customer. Samples are very expensive for the company to produce- that’s what bonus time is for. Has anyone purchased the ‘free’ beauty samples advertised on the Clinque website? I ordered a moisturiser about 3 weeks ago and have received nothing yet! The order does come from the US, so maybe I will get it eventually. I have been to 3 Clinique stores in in Holloway, Brent cross fe wick and Brent Cross john Lewis to enquire the samples to try for my over sensitive skin. Each assistant refused to give any samples for me to try before buying in case of a flare up and then said we are not given any sample. It’s better I go to my usual helpful Christion Dior counter if I ever need any make up. If you can get to a House of Fraser I have found their counters to be a bit more inclined to give a small sample, even if they don’t have pre-packaged one’s you can ask them to take from the tester in a small plastic container, which they do have. Failing that-I can’t speak to John Lewis-but if you purchase a product and it causes irritation just take it back to HoF and get your money back. I went to Harvey Nics last Friday to buy my clinique to be told there was no gift as they had sold out. As you walk into the Beauty section of Harvey Nics there is a massive promotoinal space for Bonus time. Whats it all about? How can you run out of a promotional gift yet still be advertising it as available. I’m afraid I walked out and didnt buy! I bought my products today in Harvey Nichols Knightsbridge and I was told that they are not running any bonus time!!! How dissapointing! Harvey Nicks London ran out of gifts today – a week early :(. Yet continued to advertise it in all their windows. Not impressed. I received the Harvey Nichols bonus gift but was not given the rinse off cleanser. Bit disappointed especially as the assistant was a bit unfriendly! Harvey Nichols in Manchester wouldn’t honour the free gift today as they said it didn’t apply to men’s products! Very disappointed in them. Don’t see where it says it has to be women’s products in the offer descriptions?! just seen this!!! Ian, Harvey Nichols are leaving themselves wide open for a discrimination claim, sexual discrimination, Equality Act 2010… where on earth are they getting their legal advise from?? Ian it shouldn’t matter. I buy mens products for my son and always get given the free bonus time gift. Hi. Will you be having a bonus time in the boots uk stores before Christmas 2013? I received this gift with purchase today from HoF in Bournemouth but did get the laser wear make up. When I read the accompanying literature I realised it was missing but can’t remember seeing it in the display. Why is it missing? Thanks.